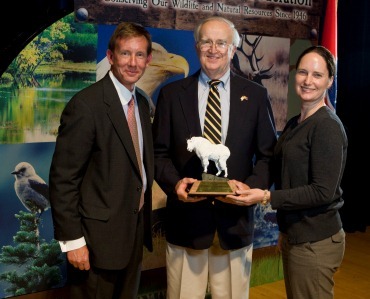 Each year since 1965, the Tennessee Wildlife Federation (TWF) has honored a select group of leaders in the conservation and stewardship of wildlife and their habitat in Tennessee. This year, East Tennessee’s Foothills Land Conservancy (FLC) was honored with the Conservation Organization of the Year award during the 46th Annual TWF Conservation Achievement Awards. The ceremony was held on Tuesday, April 19th, 2011 at the War Memorial Auditorium in downtown Nashville. Foothills Land Conservancy receives TWF’s Conservation Organization of the Year award. (Pictured left to right) Dan Hammond, TWF’s Chairman of the Board; Ernie Blankenship, FLC Board Member; and Elise Eustace, FLC Communication & Development Director. A selection committee comprised of TWF members, Board representatives, conservation professionals and members of the media reviewed all nominations and decided on the winners. Foothills Land Conservancy received the Conservation Organization of the Year award for outstanding achievement by an organization for work in some phase of conservation during the contest year. 2010 was a milestone year for Foothills! FLC celebrated the completion of the “25 in 25” campaign – preserving 25,000 East Tennessee acres by the organization’s 25th year of service. Launched in October of 2007, FLC committed to create a regional initiative that would maximize land owner interest while raising awareness of its mission throughout the community. established, assisted or donated over 10,000 acres of land for local parks and recreation areas. conserved over 8900 acres of productive agricultural lands and natural areas between 2006 and 2010.
assisted landowners in creating over 70 conservation easement agreements in a total of 13 East Tennessee counties. The mission of Foothills Land Conservancy is to protect, preserve, and enhance the natural landscape of the East Tennessee region. FLC provides landowners the tools and resources to protect their property from development in perpetuity. All conservation easement agreements coordinated through Foothills are voluntary, customizable, approved by a Board of Directors and monitored at least once a year. FLC is a 501(c)(3) non-profit and does not receive any financial support from federal, state, or local governments. To learn more about Foothills Land Conservancy, please visit their website at www.foothillsland.org or contact their office at 865-681-8326.